**AVAILABLE NOW** - Lamborghini Charlotte is proud to offer this beautiful 2016 McLaren 675LT Spider This McLaren includes: FRONT & REAR PARKING SENSORS Rear Parking Aid FIRE EXTINGUISHER ORANGE, SPACE FABRIC SEAT TRIM Alcantara Seats CARBON FIBER SILL PANELS W/BRAND LOGO STEALTH WHEEL FINISH TOURING SEAT SIZE Bucket Seats CARBON FIBER SIDE INTAKES GLOSS BLACK MACHINED 675LT LOGO WHEEL FINISH WARNING TRIANGLE MERIDIAN SURROUND SOUND UPGRADE Premium Sound System STEALTH MCLAREN BADGE SPECIAL PAINT MCLAREN TRACK TELEMETRY Back-Up Camera REAR PARKING CAMERA Back-Up Camera SILICA WHITE ELECTRIC STEERING COLUMN Adjustable Steering Wheel CARBON FIBER EXTERIOR UPGRADE PACK VEHICLE LIFT UPGRADE SOFT CLOSE DOOR LATCH CAR COVER CONTRAST COLOR SEAT STITCHING MCLAREN ORANGE BRAKE CALIPERS W/BLACK LOGO CARBON FIBER EXTERIOR MIRROR CAPS TIRES: P235/35R19 FR Tires - Front Performance Tires - Rear Performance ASHTRAY Original MSRP $421,650 *Note - For third party subscriptions or services, please contact the dealer for more information. * Your buying risks are reduced thanks to a CARFAX BuyBack Guarantee. Today's luxury vehicle is not just about opulence. It's about a perfect balance of performance, comfort and attention to detail. This 2016 McLaren 675LT is the perfect example of the modern luxury. If you're in the market for an incredible McLaren featuring an Entertainment package that will surely keep your passengers enthralled, then you'll definitely want to check out the McLaren 675LT spider. 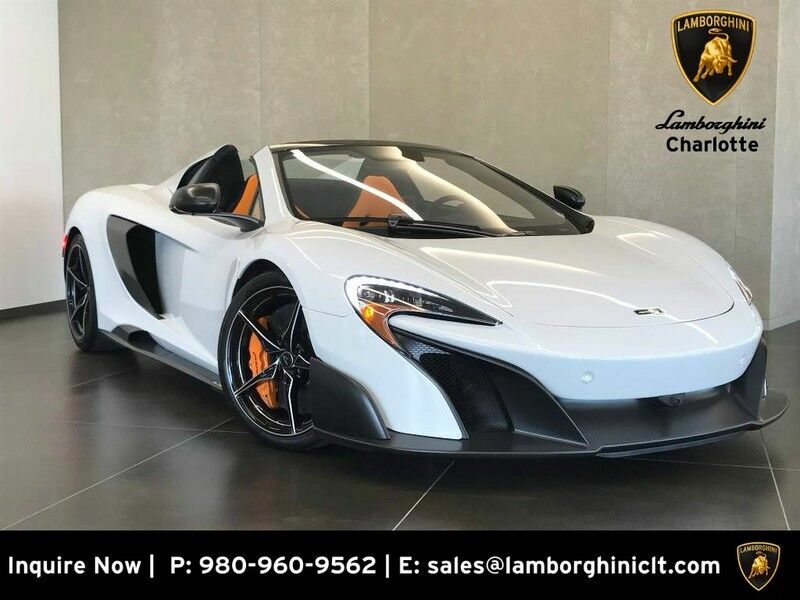 Marked by excellent quality and features with unmistakable refined leather interior that added value and class to the McLaren 675LT More information about the 2016 McLaren 675LT: The McLaren 675 LT starts at over $350,000, making it one of the more expensive cars on sale in the United States. It's more expensive even than the Ferrari 488, which starts at around $280,000. However, there is another way of looking at things. The McLaren P1 costs over 1 million dollars, while the 675 LT offers almost all of the performance for a fraction of the price. So although the 675 LT is expensive, more expensive even than its rivals, it still manages to punch well above its weight class. There is precious little under a million dollars that can match a 675 LT on the race track. This model sets itself apart with Formula 1 DNA, exclusivity, unrivaled handling, Blistering acceleration, and exotic styling This vehicle is eligible for extended service agreements, as well as competitive financing and leasing, please ask for details! Lamborghini Charlotte offers extremely competitive financing, nationwide delivery, and a down to earth buying process without equal. Call today and experience the difference. Real Time Market Pricing: Technology has changed the way cars are bought and sold. Transparency has become the norm. We have philosophically embraced the change and utilize state-of-the-art technology to constantly monitor pricing, and position our prices to reflect up to the minute transactional data. It is our philosophy to keep the process as easy and as quick as possible. After all, it is not our goal to sell you your next car. It is our mission to sell you the next Ten! **While every possible effort is made to accurately describe our vehicles and their availability, we recommend that you please verify availability of your vehicle of interest before making the trip to see us. Thank you for choosing Lamborghini Charlotte! ** WHY CHOOSE US --- Lamborghini Charlotte represents the highest standard in the industry with a personal, genuine, and down to earth experience without equal. We offer extremely competitive and customized financing and leasing, nationwide delivery, and vehicle customization for those who desire. Inquire today and experience the difference. Please note that vehicle showings and test drives are offered by appointment only. We are open 9:00am-6:00pm Monday-Friday, Evenings and Weekend By Appointment Only.